Although the premise for Twelve ( XII ) is not entirely original the way the story unrolls is interesting. We are introduced to a Leonard Karlsson (Jeremy Fitzgerald) in the run up to him leaving prison and via flashback become aware that his time in prison wasn’t fun at all. In fact it looked pretty horrendous and involved him having his face pulled off. We are then transported to a desert road on the outskirts of Arizona. Where a “just married” couple are heading off in a black convertible to their new life, a red pick up pulls up alongside them. The pickup driver lifts a gun and blows the head of the groom off and so starts Twelve ( XII ). The rest of the film focuses on a dinner waitress Claire (Emily Hardy) and her close friends including Vicki (Mercedes McNab – Buffy’s Harmony) teaming up with FBI Agent Naughton (Steven Brand) hot on the trail of the killer and local town sheriff Officer Kent (Nick Searcy) as they slowly put together that Leonard Karlsson has come back home to extricate revenge on the Twelve ( XII ) jurors that were involved in his conviction. Look although I love a good revenge tale but Twelve ( XII ) wasn’t really my cup of tea. I liked the way the story unrolls and Michael A. Nickles does away with lame exposition that bogs down many similar features. A special mention for the soundtrack – which is punching way above its league. Leonard Karlsson is played like a mixture of the poor cousin of John Kramer (Jigsaw from Saw) and Jason Voorhees, we never get to know anything about him as he silently visits the jurors one by one and dispatches them in increasingly gruesome ways. I think he even cuts off their faces as revenge for his own mutilation. Anyway via the different deaths we end up at his lair where he has imprisoned the remaining jurors ala Saw style as he tortures them. This leads to a bloody showdown. Too be honest it would have fit neatly into the video nasty pile that I may have peeked at when I was 14 years old (irreparably scarring me) along with greats like The Burning, My Bloody Valentine, etc. All of which still haunt me today. The pacing doesn’t really allow substantial tension or suspense to build before the chop. Which deflates some of the scenes and doesn’t allow atmosphere to be created. It’s a schlock splatter fest with some decent moments however the small production and by the numbers plot doesn’t really allow the Director or cast to shine. It’s the kind of film that you know will spawn a sequel in which Karlsson is revealed to have actually not done anything wrong and was wrongly convicted by the courts. The DVD includes some “making of” features; “Beneath the skin”, “Make up FX gallery” and the short but interesting extra “A shotgun in the head” which breaks down the composite shot of the grooms head been blown off. 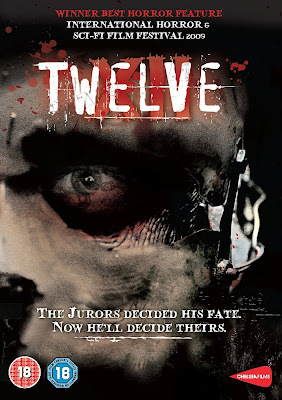 Judge the Twelve ( XII ) on DVD for yourself right now.